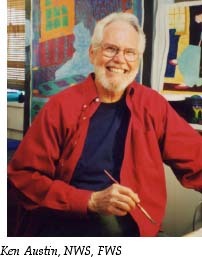 In 1998, a group of watercolor enthusiasts was organized in Orlando by CFWS member, Ken Austin. Initially known as the “Aquamedia Society”, a spinoff renamed the “Central Florida Watercolor Society” began in September of the same year. The membership totaled 120 that first year. It is the mission of the CFWS participating artists to open membership and meetings to anyone interested in watercolor regardless of their expertise. CFWS membership is made up of a diverse mix including accomplished artists willing to share their knowledge as well as novice members eager to learn more. Our meetings are held monthly from September thru May and guests* are welcome at meetings. Meetings provide a chance for the members to network, keep up on CFWS business and take advantage of demonstrations by member and visiting artists. Volunteer opportunities are always available, speak with a board member to find where you can contribute. The CFWS membership elects the officers who serve for a term of 2 years. Board members other than officers are appointed by the society president. The board meets third Monday of the month. All members are welcome to attend the board meetings. Check the event area for specific times and location. *A $10 guest fee will be charged for nationally known artist’s demonstrations. Members and non-members are also encouraged to email board members with suggestions, questions and/or concerns. Become a CFWS Member Now.